LONDON — May 24, 2017 — Trifacta, the global leader in data wrangling, today announced the Spring ’17 Wrangler Enterprise release, focused on accelerating the expansion of data wrangling projects in enterprise environments through advancements in self-service scheduling, sharing and sampling capabilities. 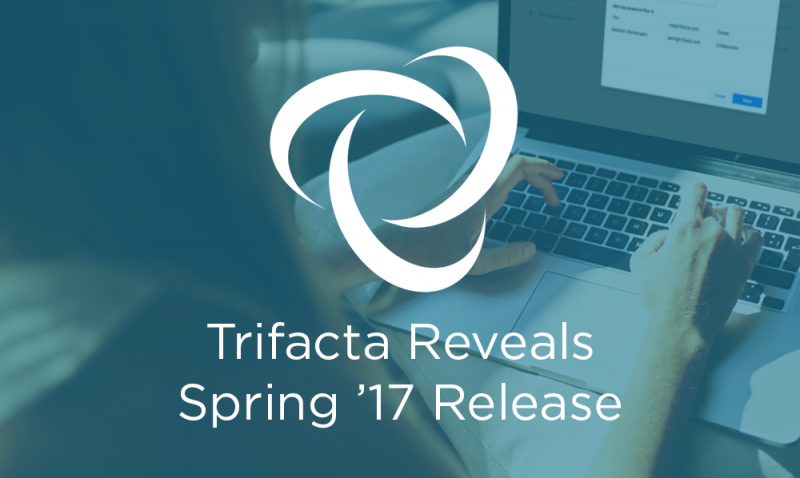 With the Spring ’17 release, Trifacta now provides enhanced features that meet the growing expectations for deploying data wrangling solutions at enterprise-wide scale. The updates improve upon Trifacta’s award-winning user experience by empowering users to more effectively manage complex workflows, share wrangling recipes and datasets, and have greater flexibility in defining samples. “At OpenGov, we’re continuously improving our speed and agility in on-boarding complex client data to our Smart Government Cloud. Trifacta’s latest release allows us to schedule the recipes and data flows that we’ve developed for our client data so they run automatically, which has allowed for more repeatable and scalable processes. We’re also excited that Trifacta gives us a visual summary of these recurring data flows for effortless management,” said Alysa Zyda, manager, customer success at OpenGov. “Rank Group depends on data to identify pricing shifts and understand relevant competition across our huge portfolio of customers. With Trifacta’s latest release, we’re able to collaborate on these efforts even further by sharing the unique transformation recipes and data flows that we’ve built in Trifacta across our entire team. We’re becoming smarter and more efficient as an organization with these new sharing capabilities,” said Pat O’Connell, CIO at Rank Group. As more data wrangling workloads move from ad-hoc exploration into production pipelines, the demands and expectations of enterprise customers continue to grow. This latest update to Wrangler Enterprise focuses on enabling users to more efficiently schedule data wrangling workflows that incorporate multiple datasets while also improving the manageability of complex workflows through Flow View. The Spring release also extends the ability of Trifacta users to share and collaborate on entire workflows, and define higher-order wrangling tasks using natural language, in addition to other new functionality – all of which are critical aspects of moving data wrangling from small-scale exploratory projects to large-scale enterprise deployments. Expanded Self-Service Scheduling and Flow View: Trifacta users with the appropriate permissions now have expanded capabilities to set up wrangling workflows and repeatedly run them according to a predefined schedule or when source data is updated. Flow View allows users to manage these workflows with a new high-level visualization of the different datasets and recipes that make up a wrangling flow. Flow View gives users an intuitive summary of the dependencies across their datasets and transformation recipes, and enables them to set and manage schedules to automatically produce results on an ongoing basis. Enhanced Collaboration: Expanded sharing functionality furthers the ability of users to work together on entire workflows, recipes and datasets within Trifacta, laying the foundation for enhanced collaboration and partnership across the organization. Increased Sampling Flexibility: Improved sampling capabilities allow users to customize a wider range of sampling techniques including filter-based, stratified, anomaly-based and cohort. These enhancements provide greater control and flexibility for advanced end users to define data samples and leverage them in developing wrangling recipes. Context Aware Wrangling Tasks: Users can define high-level tasks in natural language that are made up of multiple wrangling steps in an effort to accelerate commonly repeated data preparation processes. These tasks are able to be shared across an organization for other users to incorporate into their wrangling recipes. Trifacta is used by tens of thousands of users at more than 7,300 companies in 143 countries around the globe. The world’s leading brands, including Google, PepsiCo, eBay, Royal Bank of Scotland, Kaiser Permanente, and LinkedIn are unlocking the potential of their data and accelerating time to insight using Trifacta’s market-leading data wrangling solutions. For more information on Trifacta Wrangler Enterprise release, check out the product page here and the blog post on the release here.